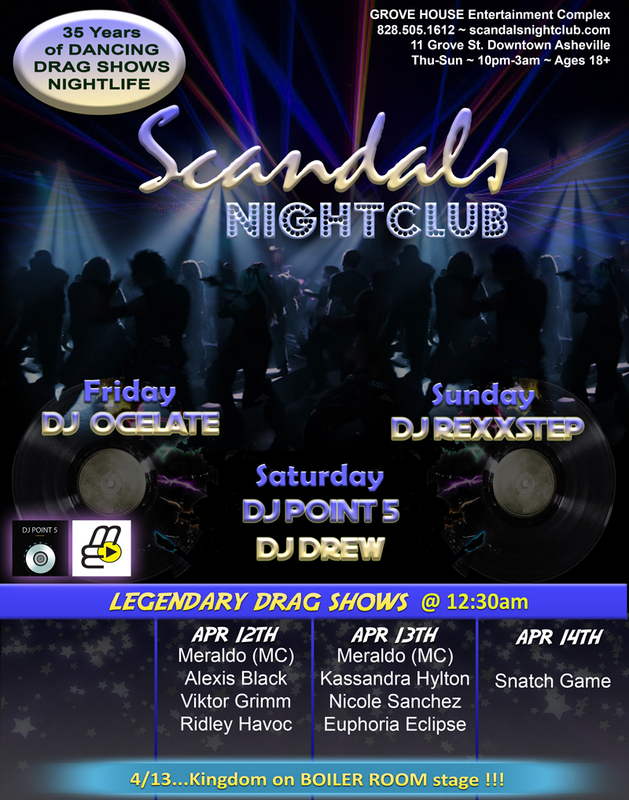 *** FRIDAY... DJ Ocelate in the Crystal Room with our Legendary Drag Show at 12:30am. 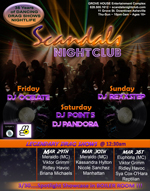 *** SATURDAY... DJ Pandora on the BOILER ROOM stage with a Spotlight Showcase at 11pm. 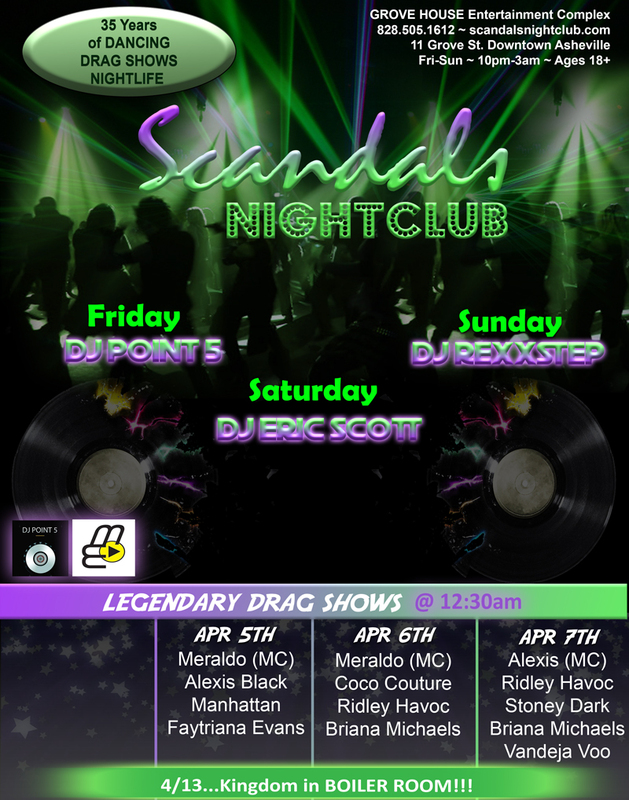 DJ Point 5 will be spinning in the Crystal Room with our Legendary Drag Show at 12:30am... 2-venues, 2-shows, 2-DJ's, One Price! 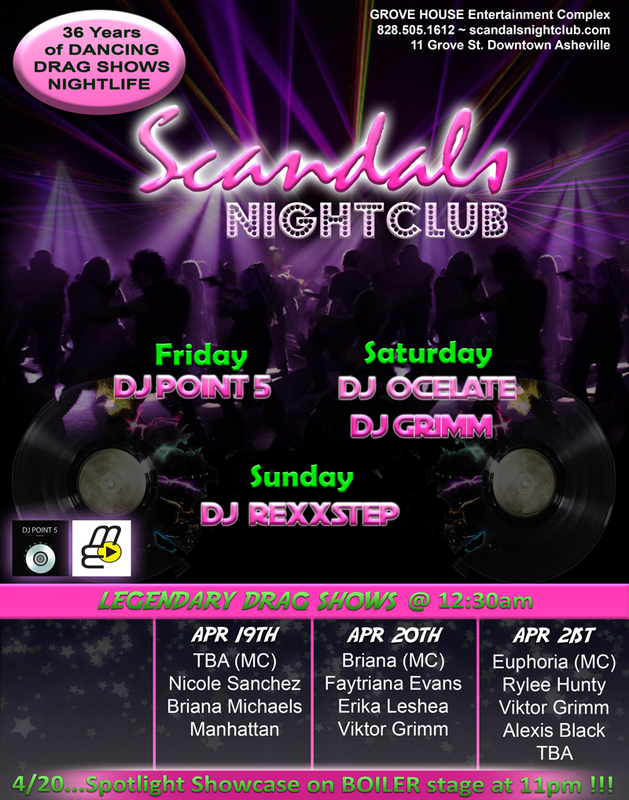 *** SUNDAY... DJ RexxStep on the BOILER ROOM stage with a Amature Drag Show at 12:30am. 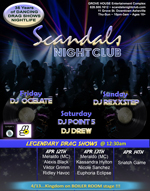 *** FRIDAY... DJ Point 5 in the Crystal Room with our Legendary Drag Show at 12:30am. 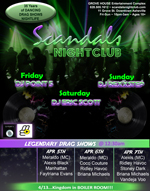 *** SATURDAY... DJ Eric Scott in the Crystal Room with our Legendary Drag Show at 12:30am. *** SATURDAY... DJ Drew on the BOILER ROOM stage with a Kingdom Showcase at 11pm. DJ Point 5 will be spinning in the Crystal Room with our Legendary Drag Show at 12:30am... 2-venues, 2-shows, 2-DJ's, One Price! 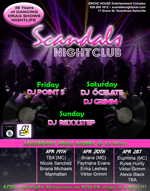 *** SATURDAY... DJ Grimm on the BOILER ROOM stage with a Spotlight Showcase at 11pm. DJ Ocelate will be spinning in the Crystal Room with our Legendary Drag Show at 12:30am... 2-venues, 2-shows, 2-DJ's, One Price! *** SUNDAY... DJ RexxStep on the BOILER ROOM stage with a Drag Queen Talent Showcase at 12:30am. *** SUNDAY... DJ RexxStep in the Crystal Room with Kingdom Newcomer Pageant. 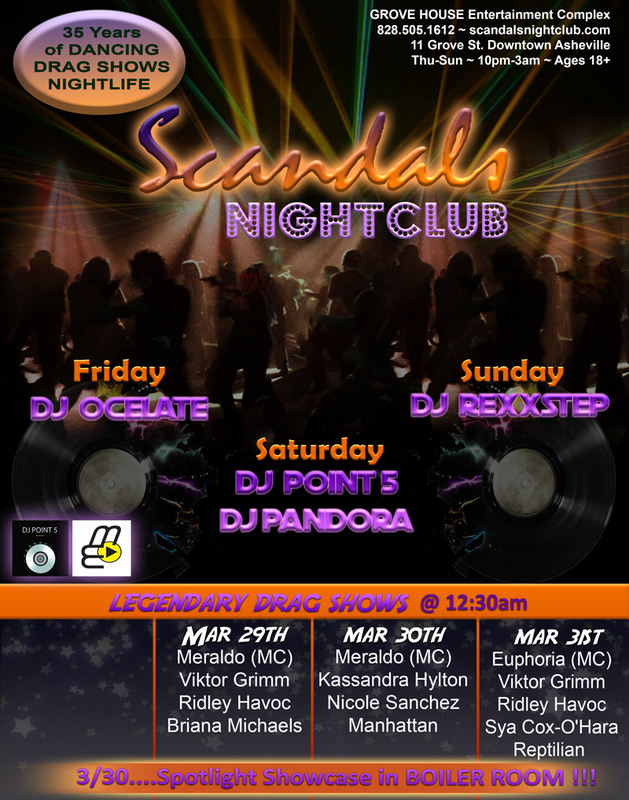 SCANDALS NIGHTCLUB | 11 Grove Street Asheville, North Carolina 28801 | © 2018 Cahoots Inc.